Toilets are the unsung heroes of a civilized, indoor-plumbing-centric world. They are used on a constant basis, day-in day-out. Not for the glory or the praise but just to keep your house nice and clean. Toilets are not infallible though. All that usage can wear on your toilet and cause problems. Do not worry, for Sunshine Plumbing of South Florida Inc has you covered. 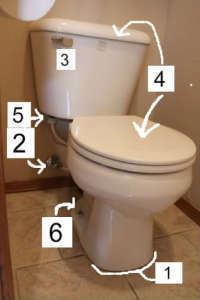 We created a six step toilet maintenance checklist for you all to run through every once in a while to make sure your toilet is up to speed. It only takes a little bit of time and can save you some money down the road by avoiding the dreaded call to your local plumber. Check to see if your toilets is caulked around the bottom. If the caulking around the toilet is deteriorated then it could cause the toilet to be loose. This will cause your toilet to rock back and forth. Check the inside of the tank and examine the guts of your toilet. While flushing, look to see the the water drains and refills. Check your flapper to make sure that it is in good shape as these must be replaced quite frequently. Check in on the shape of your tank-to-bowl bolts as well as your tank-to-bowl gasket. These rust and deteriorate pretty quickly which can leaking to a leak in the tank. Check the bolts that hold your toilet and the toilet flange. If your toilet is rocking back and forth then this may be because the bolts are rusted out or because the flange or wax ring under your toilet has rotted away. So there you have it folks, our six step toilet maintenance checklist. Run through all of these steps maybe every few months. Perform the proper maintenance techniques when necessary and your toilet will be running as good a new. If there are any problems with your toilet then check our blog; we just might have the answers to your questions! If not then make sure you contact a plumbing professional to take care of your commode. Proper care for your toilet is nothing too difficult, it just requires that you pay attention. So don’t forget about your everyday hero residing in your bathrooms.